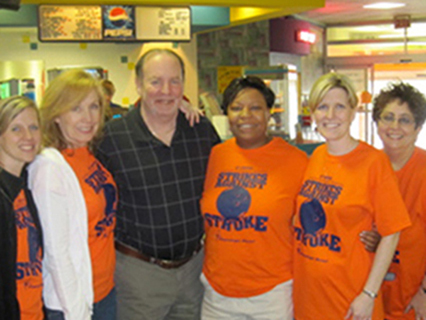 Mark Roth, a member of the PBA (Professional Bowling Association) Hall of Fame who is arguably one of the top five bowlers ever, will be on hand at Upstate University Hospital’s Strikes Against Stroke fundraiser Sunday, May 6. Roth’s appearance at the fundraiser, to be held from 10 a.m. to 2 p.m. at Flamingo Bowl, 7239 Route 57 in Liverpool, is noteworthy, not because of his legendary status among bowlers, but because he’s a stroke survivor. Roth suffered a stroke in 2009, and underwent extensive rehabilitation at Upstate. “He has come a long way, but it’s been a lot of work,” said his wife, Denise, from their Upstate New York home. Roth uses a quad cane and still has some loss of movement in his left arm. His speech has improved greatly. He’s even making strides on the lanes, where he’s able to use a 16-pound ball and a two-step release. Roth, one of the winningest bowlers in the history of the sport, is a four-time PBA Player of the Year. He holds the record of eight tournament wins in a single season (1978), and was the first bowler to convert the 7-10 split on national television. Proceeds raised at the event will go to support patient and family education programs, direct patient care needs and community awareness programs. Entry fee for Strikes Against Stroke is $15 for stroke survivors; $20 for children under 12; and $30 for the general public. Fee includes a T-shirt, two games of bowling and shoe rental. To register, call 315-464-8668. The event will also highlight the benefits of the Upstate Stroke Center, Central New York’s first designated stroke center with the region’s only specialized neuroscience and rehabilitation floors, neuroscience step-down and neuroscience intensive care unit. Among the many accolades for Upstate’s stroke care is its recognition by the American Heart Association and American Stroke Association as a Gold Plus achievement award winner for quality outcomes. Caption: Mark Roth and Upstate employees, from left, Danielle Wheeler-Vickery, Laurie Typhair, Roth, Kim Brown, Carrie Garcia, and Sharon Klaiber.